Manzanillo is one of the most beautiful beach destinations in Mexico, situated on the Pacific coastline between Puerto Vallarta and Acapulco in the state of Colima. Manzanillo, Mexico boasts miles of golden sandy beaches fringed by lush fruit plantations and jungle vegetation and three beautiful bays shaped by the foothills of the Sierra Madre. It is often compared to the beauty of its neighbor to the south — Puerto Vallarta — except without the crowds and development. Manzanillo still holds the charm and romance of an old-world Mexican fishing village with its narrow streets weaving up the hillsides, giving way to stunning ocean views, lush vegetation, and a breathtaking mountain coastline. Geographically, Manzanillo can be divided into two areas, Bahia De Santiago is the most northern bay, and Bahia De Manzanillo is the Bay directly north of the town of Manzanillo. Bahia de Manzanillo offers an array of luxurious resorts and hotels with fine restaurants offering everything from water sports and deep-sea fishing to golf. For those seeking more seclusion, Bahia de Santiago is a far less developed area with only two resorts. The costal highway between the two areas is dotted with fine restaurants, shopping and nightlife. It should be noted that although Manzanillo has become a major tourist destination, it is still first and foremost a commerce and shipping town. The downtown area is a busy commercial port, considered the largest port in Mexico surpassing Veracruz, with railways to Mexico's interior. 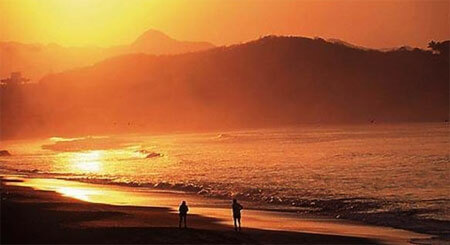 The Manzanillo area is known for its amazing beaches that offer stunning sunsets. It is even rumored that it is one of the best places to see a green flash during a sunset. Most travelers come to Manzanillo for two things — fishing and golfing. Manzanillo known internationally as the Sailfish Capital of the World, hosting several important national and international fishing competitions. It's also a major golfing destination, with three world-class golf courses, some of which are surrounded by lagoons and mountains, and offer an ocean view. Manzanillo is a tropical paradise, with sunny skies 365 days a year and temperatures in the mid 70's to low 80's, making it an excellent place to visit, live or retire.